What suits my application best? It may happen that you are completely new to usage of laser levels, and you may be considering move to purchase the best laser level for your job. Let that not worry anymore below is a layout of guide lines that may help you in deciding what type, quality and effective or accurate laser for you to go for. There are various lasers that you may settle for, but your choice will be determined by your values and the type of application or job you want to perform. For instance when looking for a laser to handle home based issues like fitting windows, you have to look for the indoor self-leveling machines and not the Bluetooth featured lasers which are commonly for contractors and commercial use. Individuals have different needs for purchasing lasers; there are those who look lasers for fitting window frames, ceiling, trenching, floor fitting and many other different reasons. Let choice not daunt you, go for the best laser for your application. Laser level is basically a technological machine or instrument that is used for setting up processes at work sites, the sites may include: buildings, roads or any other type of construction development and settings. Usage of a spirit level is effective over short distances and in small working environments but either way they are too tedious and time consuming and cannot be applicable to large work sites like development of airports and road constructions. The marginal errors may elucidate as they are bound for using under short ranges and mostly indoor applications. Instead, laser levels are very accurate, precise, and easy and are applicable to very long distance ranges, this helps in solving many contractual works and big firm problems. There are three main types of laser levels. Two among the three levels produce static output; they produce a thin coloured lines or dots which are visible on the opposite side of the machine. The third type is the rotary laser levels and the mechanism of working of the rotary lasers is very unique. A prism is carried around by electronic motors and produces laser dots in lines through 360 degrees. In indoor work situation when the rotational speed is very fast it produces a visible line and not dots. This is very powerful laser and can work in very large distance work sites. Laser levels have got very pronounced variable accurate levels, this accuracy levels are measured accuracy levels over a particular distance cover. It is the distance cover that the machine can accommodate and at the same time show visible and pronounced results. The accuracy levels are quoted as plus or minus Xmm at different distances. This is because different lasers produce accuracy at different distance covers. In determining the difference in accuracy of laser levels one needs to look at the number value, for instance if you have two lasers X and Y and let’s say X has an accuracy level of +/- 2 nm @ 30m while Y has an accuracy of +/-1.5nm @ 30m respectively, then the Y laser is more precise and accurate than X because the value of + or – is less in Y than in X. when there is a difference in the distance cover then the greater the distance cover the more accurate the laser is as it means the laser can cover a longer distance. The less priced lasers mostly tend to be manual setting lasers, am not commenting on the lasers accuracy but the manual lasers are hard to operate as compared to the automatic lasers, because in the manual lasers the operator has to adjust the laser setting and this may not be accurate enough. 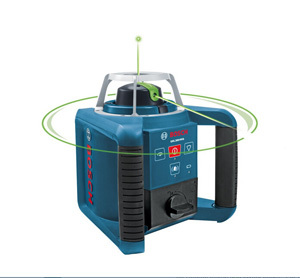 The automatic lasers are mostly a one button switch lasers and once they are switched on they carry out self-leveling through rotating and giving out the desire true level line around the worksite. When the laser is disturbed while in the process, it stops this avoids giving out of inaccurate report. The static line or dot lasers, are other forms of auto-level lasers they auto level immediately because they are just a button switch lasers, their mechanism of work is based on pendulum which are quick to learn. Most of the models have multi-laser outputs and many other highly featured applications. Many people ask a lot of questions on the choosing of the type of beam colors. Why should one choose a laser by the color of the beam? For instance why should one choose Green over Red beam lasers? This is because most people prefer brighter colors than the dull colors. Green lasers are brighter to eyes but are a little bit expensive to produce. They are commonly used in indoor work stations on large scale projects as contractors prefer using the laser liners than detectors. At outdoor operations the green lasers beams are not required because contractors must use detectors for clear vision under all circumstances. This is a separate device from the laser, which mostly must be accompanied in the compact pact of the laser commonly used for the outdoor operations for the detection of the unseen laser lines due to light and other climatic conditions. This lasers use specific detector types but all have red windows and internal electronics for indication of the center of the lines. This indicator mostly appears through LED audio sounds or LCD with bold up and down arrows. Do I need a Laser Detector? Many individuals find themselves indifferent on whether they need a detector or not when purchasing lasers. The decision to the question lies down to the size or magnitude of the work to be performed by the laser. This varies again on the environment of the job, is the laser intended for working indoors or is it intended for working on outdoor sites? For outdoor work it’s most obvious that you will need to have a detector for enabling the user to be able to see the beam lines which may be micro. For indoor purposes the user can trace the lines via naked eyes so no need for a detector, but exceptions occur when handling long distances in indoor operations may force in for detector use or when the rooms are filed with sunray reflections tempering with the visibility of the laser lines. This calls in the use of detectors. Many contractors dislike the use of detectors, thus preferring the use of naked eye vision in their projects. This is bolstered by the use of more powerful and expensive multi-lasers which have the options for expanding the detection ability of the machine for bold visibility. But all in all detectors are necessary for lasers and operators in the outdoor operations. Projects vary by their place of action; there are all outdoor projects and all indoor projects. But in some cases there may be some part time outdoor and others part-time indoors, however many clients want to know whether with one laser you perform the outdoor and the indoor operations. Many specifications are included in the product reviews but briefly lasers with detectors are particularly for outdoor operations and the indoor operations are commonly done using the cross line lasers. More to this advice is that there are also some of the lasers with exceptions and can be sand-witched in handling both indoor and outdoor operations. On top of this for a sand-witch laser it must be incorporated with a detector. This are initials for international protection ratings, which accounts for the protection value of the lasers, this ratings are given to the machine to indicate its ability to resist water and dust in a normal environment spillovers and not explosion. Good example for this is the IP54, where by 5 indicates the dust ingress & no.4 shows water resistance. In this ratings accord, the higher the numbers, the better the level of protection. For dust doorway, 5 are regulated to not realizing the performance of the laser machine and 6 implies it is completely dust tight. Below are the water specification numbers and their relevance in lasers. If the lasers are not IP rated or their rating less than IP54, the laser is not waterproof for outdoor operations. The highest protection value offer is IP67. 4 – Water spill overs from any direction cannot harm the laser. This is called; driving rain. 5 – Nozzle water projection via (6.3mm) cannot affect the laser. 6 – Powerful jet water projection of below 12.5mm nozzle against the laser cannot have any harmful effects. 7 – Submersing in 1 m deep waters for less than 30 minutes cannot harm the laser. Most of the lasers can level n all formats only a few can level either horizontally or vertically. Some of the cheaper models can only level horizontally, this does not imply that clients should go for the expensive lasers but they should try to find the laser that satisfies their requirements or their need and budget. One can buy a very expensive laser that has very many features and later find that the features are not useful to his place of work. This is very important because people have to be more goal oriented, purchasing a tool that will meet their expectations not that will exceed what they wanted. When an individual wants to set out drainage runs or big centers like ground works then, the grading options comes in to enable the user to over-ride the self-leveling mechanism and align the beam at its position or grade. There are several calculations for setting up your grade, which mostly relates to the distance from the laser. This is needed for the big work centers where a lot of features are necessary. Laser levels MUST always be mounted on general level and firm surfaces or stands. The reason is that the position of the laser forms the base of every task that bound to be done by the machine. An individual is always free to select the best platform for placing or positioning his or her laser. They can select from a variety of accessories to aid positioning and mounting process. Walls, tripods and laser poles have small mounting thread. It is vital for matching the thread of the laser to that of the accessory. All lasers are distance bound devices, they use the Leica technology they are hand held machines and perform the same duty, and however it is ideal for a client to understand what he/she wants from the machine. If purportedly a client’s interested or wants a machine for, home or indoor work then the short range lasers are deservedly the best to go for. Every client wants the best tool for his work and that means going for the tool that will maximize the utility of the client, and not having the most accurate laser while it has no purpose for the client’s needs. Most of the machines are user-friendly they analyses areas, volumes and angles for the users comfort ability with just a button click away. Others have diverse features like Bluetooth that enables them to download measurements to client’s computers. ALL laser level kits are checked, confirmed& tested “in-house” this is done to make that they conform to their Manufacturers stipulated specifications. Certificates for lasers are offered after purchase to show that the client owns the equipment.